"The story is well-written and wonderfully illustrated and is made even more interesting when combined with the Web page games and related links. 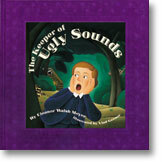 It's bound to be a favorite among parents and teachers of grumpy children!" "The theme of this book is one that every child can relate to, and one that every child can benefit from. The excellent bold paintings . . . enhance the text." ". . . [A] great storyline with grand, large, full-colored illustrations. The making for a classic. Deserves a place in both private and public children's collections."